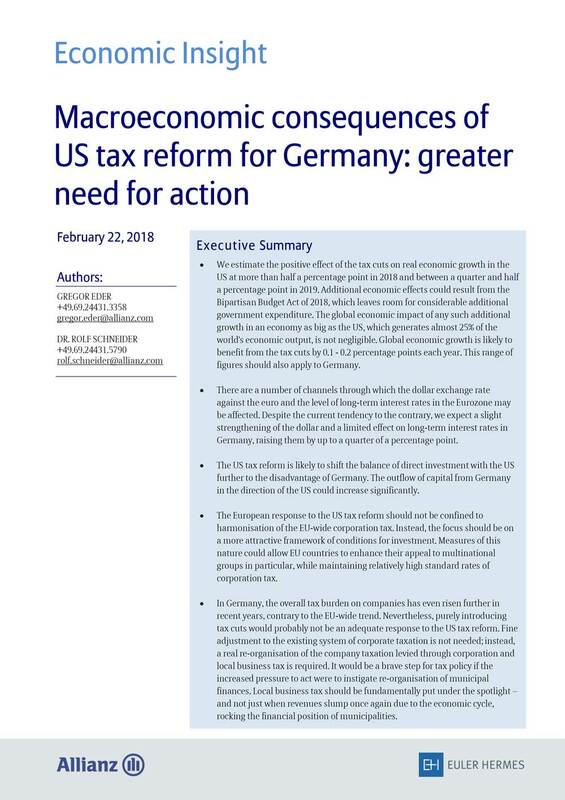 Euler Hermes estimates the positive effect of the tax cuts on real economic growth in the US at more than half a percentage point in 2018 and between a quarter and half a percentage point in 2019. Additional economic effects could result from the Bipartisan Budget Act of 2018, which leaves room for considerable additional government expenditure. The global economic impact of any such additional growth in an economy as big as the US, which generates almost 25% of the world’s economic output, is not negligible. Global economic growth is likely to benefit from the tax cuts by 0.1 – 0.2 percentage points each year. This range of figures should also apply to Germany.